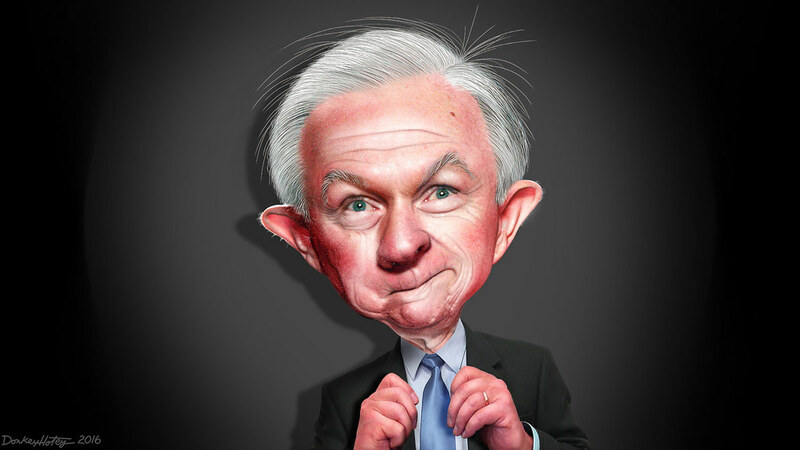 White House staffers reveal Trump’s nickname for Sessions as his contempt for his Attorney General solidifies in the wake of Mueller’s success in the Russia investigation, but – as The Washington Post noted – the joke’s on Trump. Trump’s relationship with Attorney General Jeff Sessions has been strained at best. Trump followed up with a two-day Twitter-tirade in which he berated Sessions for his “VERY weak position on Hillary Clinton crimes” and questioning why he had not launched an investigation into Ukrainian efforts to help Clinton during the 2016 presidential campaign. “Ukrainian efforts to sabotage Trump campaign – ‘quietly working to boost Clinton.’ So where is the investigation A.G.” he tweeted. Most recently, Trump took to Twitter again this week, criticizing Sessions once again. “Why is A.G. Jeff Sessions asking the Inspector General to investigate potentially massive FISA abuse. Will take forever, has no prosecutorial power and already late with reports on Comey etc. Isn’t the I.G. an Obama guy? Why not use Justice Department lawyers? DISGRACEFUL!” he tweeted, prompting more speculation that Trump is interested in forcing Sessions out so he can replace him with someone else who would shut down Special Prosecutor Robert Mueller’s Russia probe. It’s no secret in Washington that the relationship between the president and the attorney general has been badly broken for months. The president has repeatedly issued public broadsides, calling Sessions “weak” or criticizing his leadership of the Justice Department, despite the attorney general’s frequent proclamations of devotion to Trump’s agenda on immigration and crime. Behind the scenes, Trump has derisively referred to Sessions as “Mr. Magoo,” a cartoon character who is elderly, myopic and bumbling, according to people with whom he has spoken. Trump has told associates that he has hired the best lawyers for his entire life, but is stuck with Sessions, who is not defending him and is not sufficiently loyal. The central gag of the Magoo cartoons was his stubborn refusal to acknowledge his terrible eyesight. That arrogance is what propels the character into his madcap adventures….The original Magoo — rich, resentful of the youth, pro-business and functionally blind — was a riff on the myopic conservatism of 1950s America, a culture gripped by the anti-Communist crusade of Wisconsin Republican Sen. Joseph McCarthy. 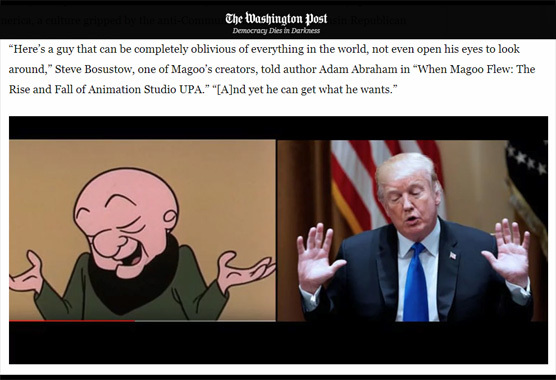 To pound the fact home that they were referring to Trump, The Washington Post place a side-by-side photo of Trump and Mr. Magoo into the article at that point. When the creators sat down to write Magoo, they were not afraid to use the character’s single-minded ophthalmological arrogance as a link to McCarthy and the fevered hunt for Communists in Hollywood and Washington.